← Some Inspiration – Eva Ubani. 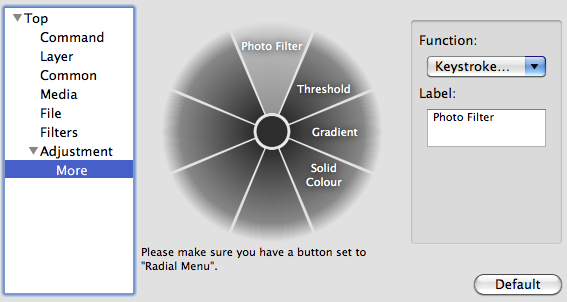 Last year at PMA in Melbourne some one asked me if they could create Adjustment Layers in Photoshop by either adding them to the Radial Menu or by adding them to the ExpressKeys. At the time I wasn’t sure, because I knew that by default Photoshop did not have shortcuts assigned to Adjustment Layers. So, I did a little playing around and you can definitely add your own custom shortcuts to add Adjustment Layers with in Photoshop. Here is how. This guide is split in to two parts; Please note that this guide is designed for the Intuos4 Medium tablet, this means that the tablet preference file available for download will only work with the Intuos4 Medium tablet. If you’re using a different size Intuos4 then you’ll have to add all of the shortcuts to your Radial Menu manually. We have asked the relevant people at Wacom to have a look into this because I believe you should be able to setup your Radial Menu and then be able to use the shortcuts with all of your tablets. Also, this guide was prepared on the Mac OS, most of the screenshots look very similar in Windows. Getting to the Wacom Preferences is also a little different. Just go to the Start menu and look for “Wacom Tablet”. 1. Creating custom shortcuts in Photoshop. 2. 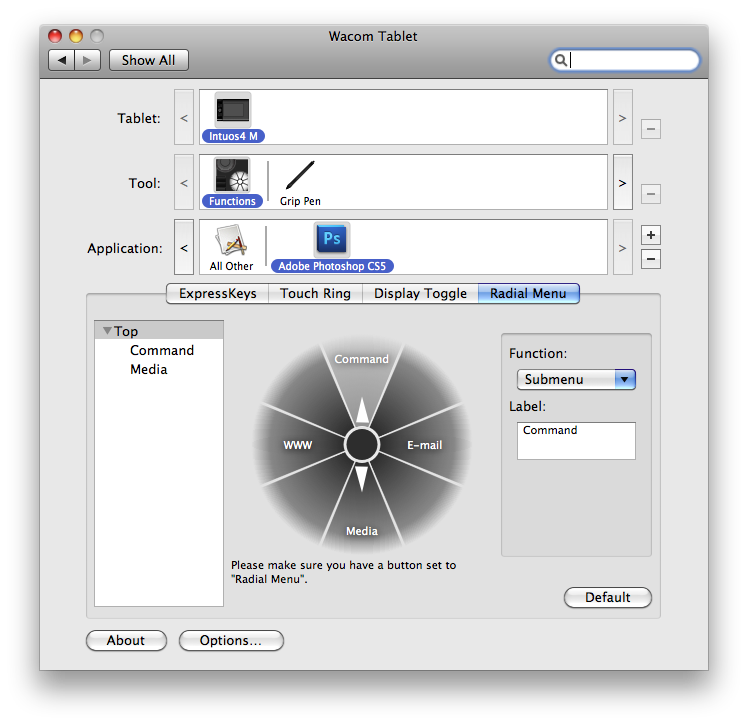 Using the Wacom Tablet Driver to add functions to your Radial Menu. We’re going to run through how to do this manually. At the end of the post I’ll provide a link where you can access a pre made Photoshop Keyboard Shortcut file. The Set: should say “Photoshop Defaults”, as soon as you modify one of the shortcuts it will change to “Photoshop Defaults (modified)”. Make sure the Shortcuts For: Drop down menu is on “Application Menus”. Scroll down to Layer and click the arrow, this will expand the menu. Scroll down a little further and you will see “New Adjustment Layer>” here you’ll notice all the names of your favourite Adjustment Layers. Now, to add your custom shortcuts it is as simple as clicking the name of the Adjustment Layer and then typing your keystrokes. Feel free to go ahead and assign them to what ever you like, I choose the above keystrokes because they didn’t really conflict with anything I already use. After you have punched in all your keystrokes either save them (so you can move them to another computer) or just hit ok.
To download a pre-made Photoshop Keyboard Shortcut file with the above shortcuts click here. (Mac platform only.) That file also contains the Wacom tablet Preferences file. More on that later. To install this file, double click on it. Photoshop will open. 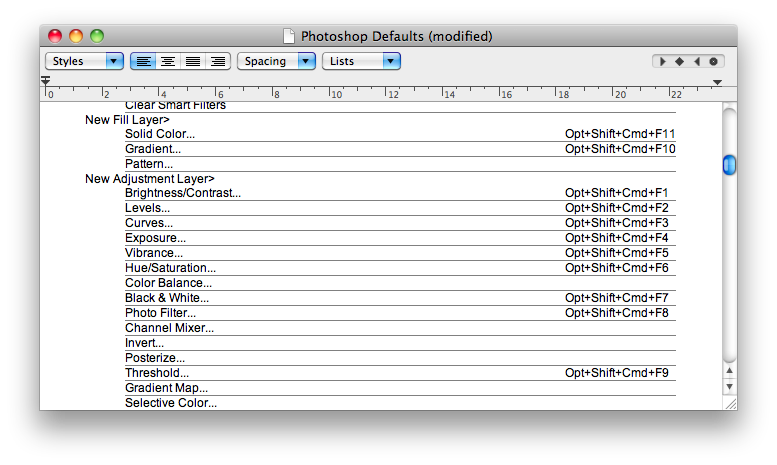 Go into your Keyboard Shortcuts Dialog and you’ll notice that the Set: is “Photoshop Defaults (modified)”. Hit the save button (Floppy disk icon with a down arrow) and name your shortcut file what ever you want. Your shortcuts are now active. 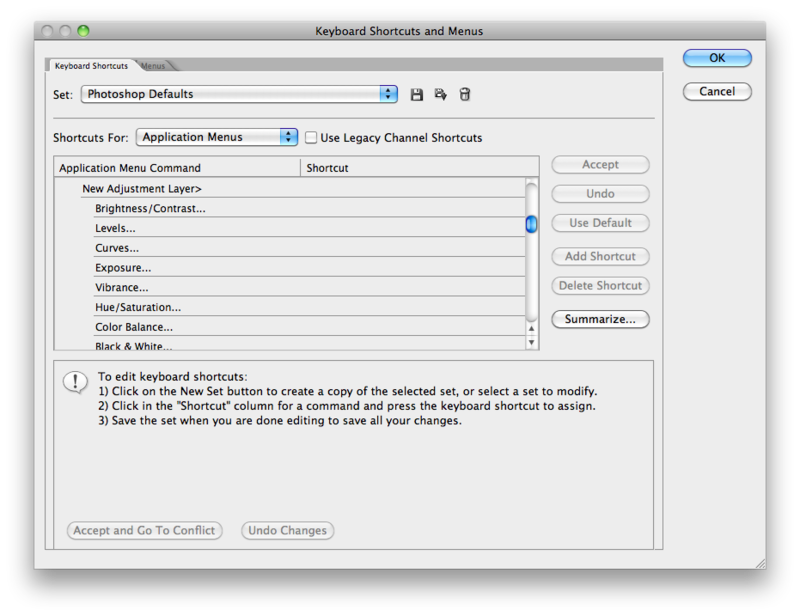 Now we need to add these Keystrokes to our Radial Menu in our Wacom Driver. 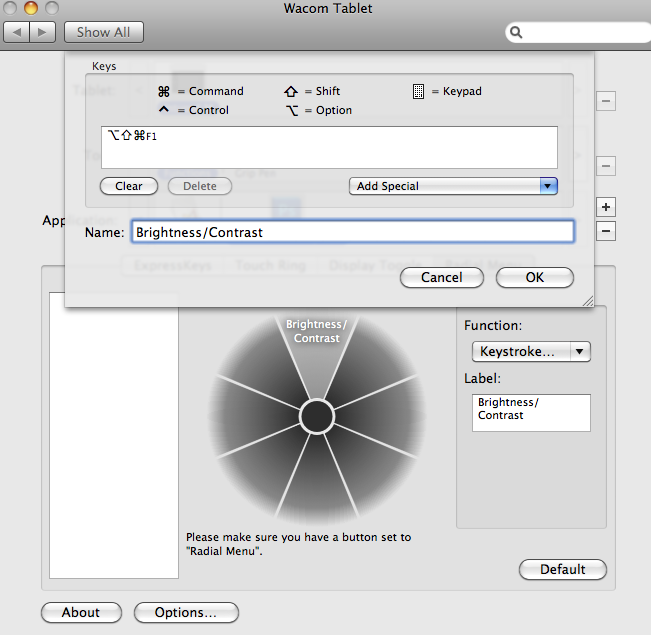 Go to System Preferences -> Wacom Tablet. Choose your Tablet: Intuos4 M (or what ever tablet you’re using) your Tool: as Functions and Application: is Adobe Photoshop CS5 (will work with what ever version you have installed on your machine) and then finally make sure you choose Radial Menu. 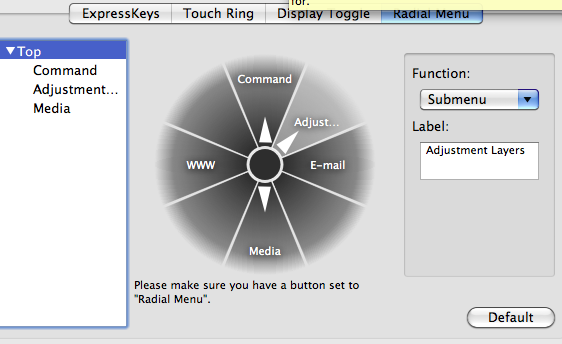 We’re going to add 11 keyboard shortcuts to our Radial Menu so we’re going to need to learn how to create a Submenu. Click on one of the empty ‘slices of pie’ and change the function to Submenu. Name that Submenu under Label: to Adjustment Layers. Your “More Adj Layers” Submenu should look a little like this. You have now customised your Radial Menu. Close this window. Now we want to save a backup to avoid losing all of these shortcuts. This also enables us to move these shortcuts to another machine. 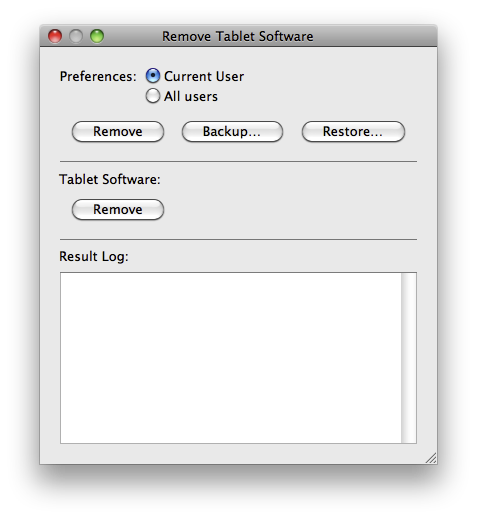 Now, click Backup… and name your new Tablet Preferences. In the future, to move these preferences to another machine you just need to move this file to another machine and either double click on it where a dialog box will open, hit Replace. Or, click Restore… and navigate to the file through the finder window. If you downloaded the zip file from part1 you would have the corresponding Wacom Tablet Preference file already. Click here (Mac platform only.) if you would like to download it. Follow the above steps to install it. Finally, when moving the shortcuts to another machine you’ll need to install the Photoshop Keyboard Shortcut file aswell as the Tablet Preferences. 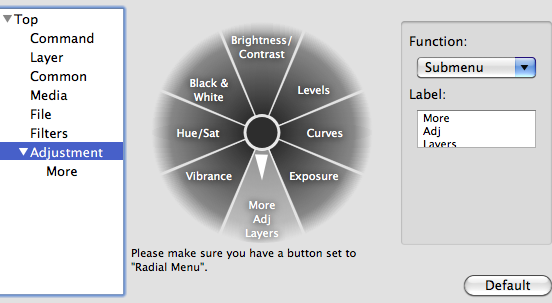 They work together to enable you to add your Adjustment Layers via the Radial Menu in Photoshop. 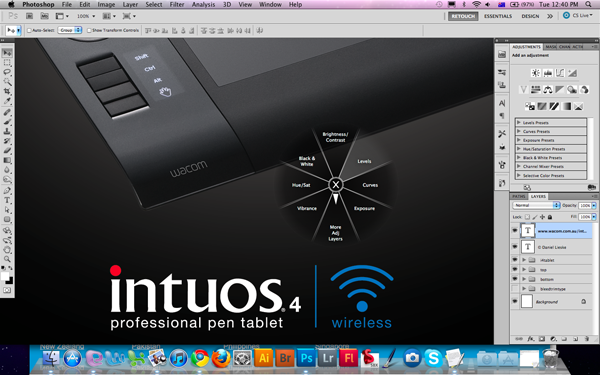 I should add that this will only work with the Intuos4 and Cintiq range of Wacom Tablets. The Bamboo range does not have a Radial Menu built into the driver. The shortcut file is missing. Can you send us a new link? Thanks for letting me know. I have created a new file and uploaded it for you. The link should work just fine. No idea what happened to the other one I had. Let me know if it works out for you. The shortcuts are straight from my setup in Photoshop so there might be a few in there you may want to change.